What was your best ever fishing holiday? I have never been on a full week's holiday fishing, but have been on a number of 2-3 day fishing breaks. I've enjoyed them all, though haven't usually caught anything great, partly because of the learning curve on a new water. I guess the best was in 2009 when I met up with Neil Smart and caught 6 barbel in a session on the Wye. Oh, and of course there was a family holiday nearly 60 years ago when I caught the first ever fish that needed a landing net. That was at Lake Bosherston in South Wales. 3 tench and a jack pike. Modest, really, but seemed huge at the time! Of course or maybe coarse as every day goes bye the memory gets worse and the story gets better. I'd have to say one of my most memorable though certainly not my "best" was one of several to England. In 1976 (America was 200 years past the Declaration of Independence that year) I had occasion to hook up with a British Tobaco Co. lad. (I was selling "western American tobacco). He arranged a session at Redmier (sp). I was told to use a "stringer". 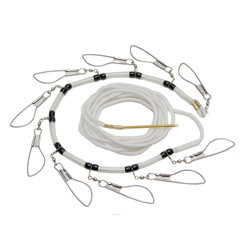 Have you any idea what a stringer looks like in the United States? Anyway among my bits and bobs was an American stringer. I didn't catch a single fish but that's not the story. They sent an older guy along with me to watch over because of the stringer. I vision Dave (Chesters1) when I think of him. I'm certain beyond a shadow of a doubt he went home with ulsers that evening. He almost wouldn't allow me to cast my own rod and he was to nervous to do it for me. The longest I ever leave a bait in the water is about 25 - 20 minutes. But not this day. He would allow me to retreive and recast because it wasn't "proper" angling. I has some god awful hard as a brick-bat little balls I had to use as bait. No wonder I didn't catch any fish. Trolling and popping in the Andaman Islands followed by Mahseer fishing on the Cauvery followed by Baramundi fishing in Goa. It was more than a week but it was a hell of a ride. Chilling in Thailand and fishing a commercial fishery was very different but also kinda cool. Not me, but my son. He came over from Western Australia for a week, visiting Dear Old Mum and Dear Old Dad. So, I took him to Lake Proserpine, an hour's drive north of where I live. 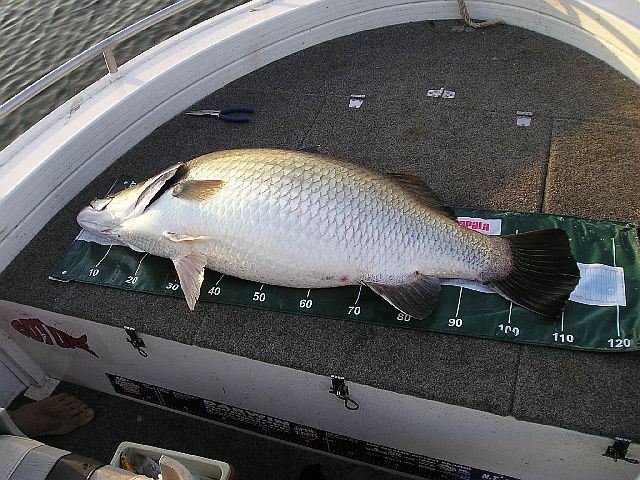 We fished at night in the main basin and got 2 double hook ups which resulted in 4 barramundi from 114 cm to 117 cm. All in the space of 10 minutes. Next day, we got 7 barra between us, one being my pb @ 119 cm. Those are monster Barra Bob. What's the weight of a fish like that? The 4 barra we caught at night were all about 20-23 kg, while the 119 cm fish was 27 kg. Beasts - and twice the size of my best. Congratulations. It might have been beginners' luck, but we finished the day with six Striped Marlin, all around 150 to 250 lb, and ran the boat out of marlin flags Flying marlin flags is an important part of skippers' bragging rights, so the crew cut up a blue dishcloth to improvise two extra flags. Coming in with six flags flapping from the outrigger was a good moment. We have since had plenty more and bigger marlin, but never again six in a day.